Eliminate scent trails left by ants by wiping the countertops and hard floor surfaces where you saw ants with a 50/50 vinegar / water solution. A 50/50 vinegar and water solution in a spray bottle: The acid in the vinegar wards them off, if not kill them.You can also try washing or spraying your cabinets and counters with the vinegar and water to deter ant infestations. Cucumber peel on a kitchen shelf will deter ants. Baking Soda is a safe insect repellent to keep ants, cockroaches and other insects from your kitchen cabinets. Place jar lids filled with water (for the insects to drink) and sprinkle baking soda (for them to eat) nearby on the bottoms of cabinets and under the sink. The chemical reaction of the two together kills the ants. Ants will not cross various substances, therefore you can lay down a line of these materials across the point where ants are entering your house or sprinkle around the foundation of the house if all entrance points are not known. Sprinkle used coffee grounds around the outside of your house. The strong smell acts as a repellant. Sprinkle powdered charcoal, cinnamon, cloves, garlic, lemon juice, black pepper, cayenne pepper, red chili pepper, paprika, dried peppermint, bone meal, talcum powder, or make a chalk line where the ants are entering. Get an organic,natural ingredient, clear dishwashing soap that is non-toxic to your pets, such as Biokleen - and seal the porch, or window seal or wherever they are getting in. Biokleen doesn't get hard, it just remains sticky so the ants get stuck in it and it isn't harmful to pets if it is accidently eaten. If it is used outside and it rains a lot, you will have to reapply often. Place bitter cucumber or citrus peels near the site of ant activity. Cucumber and citrus peels are toxic to the types of fungi that ants feed on, and therefore avoided by the ants. If you can find a hole where ants are entering the house, squeeze the juice of a lemon in the hole or crack. Then put the lemon peels all around the entrance. Locate the ant colony and pour boiling water over the ant mounds and into the cracks where they dwell. Please be careful if these are aggressive ants. Wearing protective shoes and clothing may be recommended. With some particularly large colonies, you may want to consider professional help. Corn meal: The ants will carry it home and eat it. But they can't digest it properly and they will die. Put the corn meal wherever you see that the ants like to frequent. This method is especially great around pets or children, as corn meal by itself is not poisonous. Ants or mites can't cross soapy water. Therefore, placing the legs of your bird's cage in small pans of soapy water will prevent ants from climbing up and getting into your pet's food. A 50/50 vinegar / water solution is a safe, chemical free solution for bird owners who are constantly having to fight ants around their bird cages. Breeders have been using this even in their aviaries and report excellent results after spraying this vinegar-water solution around the perimeter of the aviaries. Of course, it needs to be repeated regularly. How frequently depends on the level of infestation. Heavy Insect Infestations: Mix 1 cup Dawn Soap to 4 to 5 cups of water. Bill suggests using a leave blower pointed at the mist from a Chapin® garden pump sprayer. He blows the mist on everything and found that the mist suffocates ants, termites, spiders from testing it on them. For tiny mite / insect infestations in the house, he blows the mist under fridge, crawl spaces, ceilings, and in the car. It works well and is cheap. Bill suggested wet vacuuming them up after a few hours. Diatomaceous Earth: You can get it at any home and garden center. It's an all natural organic pest control solution - an abrasive powder made from mineral remains of single cell aquatic plants. It kills by abrading and dehydrating crawling insects, like slugs, ants, cockroaches, earwigs, grasshoppers and fleas. NOTE: The dust is a serious irritant to people's lungs, especially children. There has been some concerns about safety arounds birds as well - so please do not use around birds and wear a protective mask when applying this powder. Cayenne Pepper and Cinnamon (can be inexpensively purchased at Dollar Stores) sprinkled liberally and equally around the foundation of the house in spring. Instant Grit: To get rid of red / fire ants in the garden sprinkle instant grit (a couple of spoon full) over the ant hill. The worker ants will take the grit down to the queen who will ingest it. The grit swells inside the queen causing her to explode. I tried it and it works. The first week, I noticed that the ant mounts were fewer and some moved to a new location. I applied it again, and the third week there was no ant mount in the entire garden. Baking Soda: Combine a teaspoon of baking soda with one-third of a cup of cooking oil... shake well in a watering can then sprinkle the mixture lightly on plants. 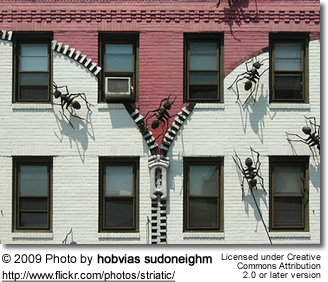 Boiling Water: Locate the ant colony and pour boiling water over the ant mounds and into the cracks where they dwell. Please be careful if these are aggressive ants. Wearing protective shoes and clothing may be recommended. With some particularly large colonies, you may want to consider professional help. Gardening: Grow spearmint, southern wood, and tansy plants around the border of your home to deter ants.